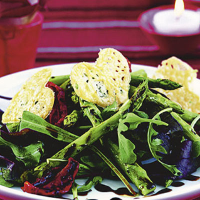 Get in the mood for romance with this simple salad that is easy to prepare in advance. To make the crisps, preheat the oven to 180°C, gas mark 4. Line a flat baking tray with nonstick baking parchment. Divide the grated cheese into 6 piles on the baking sheet and press down to flatten slightly. Place the baking tray in the oven and cook for 5 minutes, or until the cheese is just melted but not coloured. Remove from the oven. While still hot, use a small heart-shaped or round pastry cutter to cut the crisps into neat shapes. Leave to cool. Toss together the roquette and chard salad, the sunkissed tomatoes and lemon juice, and pile onto 2 serving plates. Heat a griddle or frying pan. Toss the asparagus tips in the olive oil and then place on the hot griddle to cook for 5-6 minutes until tender. Remove the asparagus and place on top of the salad. Drizzle with the balsamic glaze and scatter over the Parmigiano crisps. The crisps need very little time in the oven - the cheese will become bitter-tasting if overcooked. Make the crisps a day in advance, cool completely then store in an airtight container.